Returning to San Francisco felt great. The road had worn me out and I was excited to stay in one place for a while. I looked forward to catching up with my friends, including a good college friend I hadn’t seen in years. 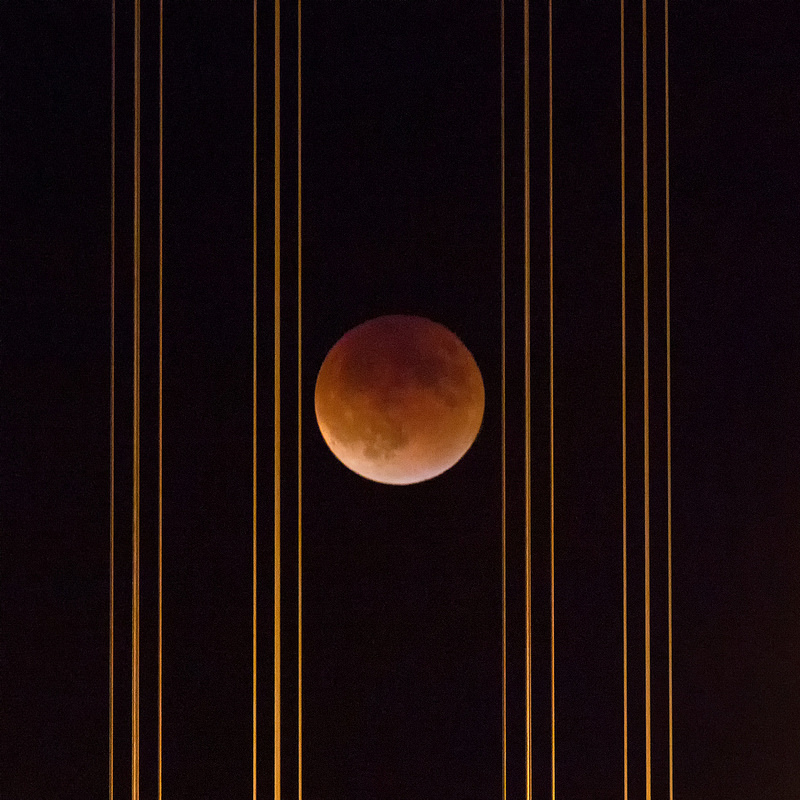 And I was fired up to photograph the Super Blood Moon. A lunar eclipse by itself is fun to see and shoot, but the night of September 27th promised to combine a total eclipse (the earth blocking the sun’s light from hitting the moon), a Blood Moon (the fourth eclipse of a lunar tetrad), a supermoon (when the moon looks bigger and brighter because it’s as close to Earth as it gets), and a Harvest Moon (the full moon closest to the autumnal equinox). All those factors converging at the same time is so unusual that it won’t happen again until 2033. And in San Francisco the moon would rise as the sun set, making the light particularly good for photography. I wished I could watch the eclipse from multiple locations at the same time, but I had to pick my spot. 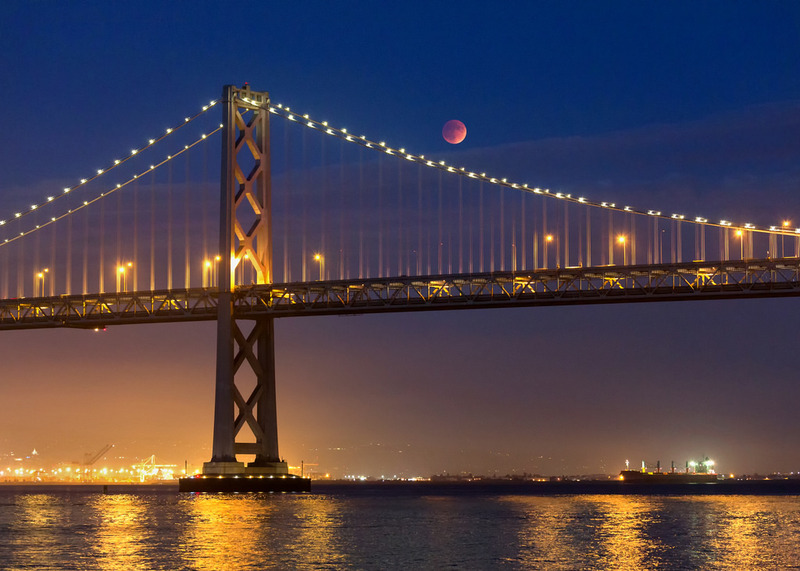 With help from an extremely useful tool called The Photographer’s Ephemeris, which shows where the sun and moon will be at any specific place and time, I decided my best option was to head to the pier right behind the Ferry Building and shoot the moon as it rose behind the Bay Bridge. I wasn’t the only one who came to that conclusion. When I arrived at the pier on Sunday I found a long line of other photographers standing behind their tripods. A layer of clouds blocked the eastern horizon, right where the moon would rise, but it was difficult to tell if the clouds were thick enough to fully obscure the moon. Turned out they were. The moonrise came and went without any sign of the eclipse. Frustrating! Finally, about 40 long minutes after moonrise, the fully-eclipsed moon emerged above the clouds. The rapid clicking of camera shutters filled the Embarcadero. Once I had a decent photo from the pier I hurried south along the Embarcadero to try some less conventional angles. 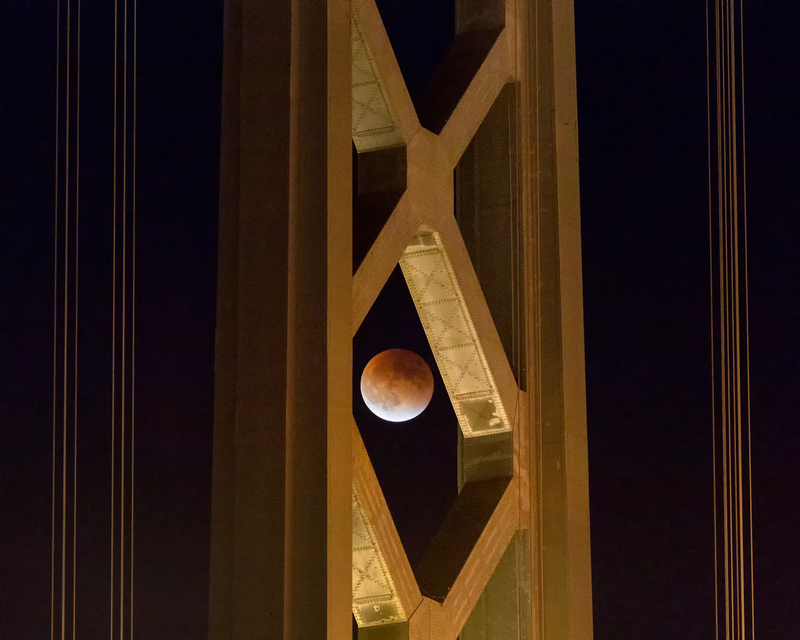 The sky was dark and the eclipse was beginning to pass, but I managed to catch the moon inside the far west tower of the Bay Bridge. Photographing the moon is tricky. One of the challenges is how quickly it moves in the sky. Any exposure longer than about half a second runs the risk of blurring the moon’s details. So when the sky gets dark you usually need to crank up the ISO, which introduces more noise to your photo. Like so many other things in life, it’s a balancing act.